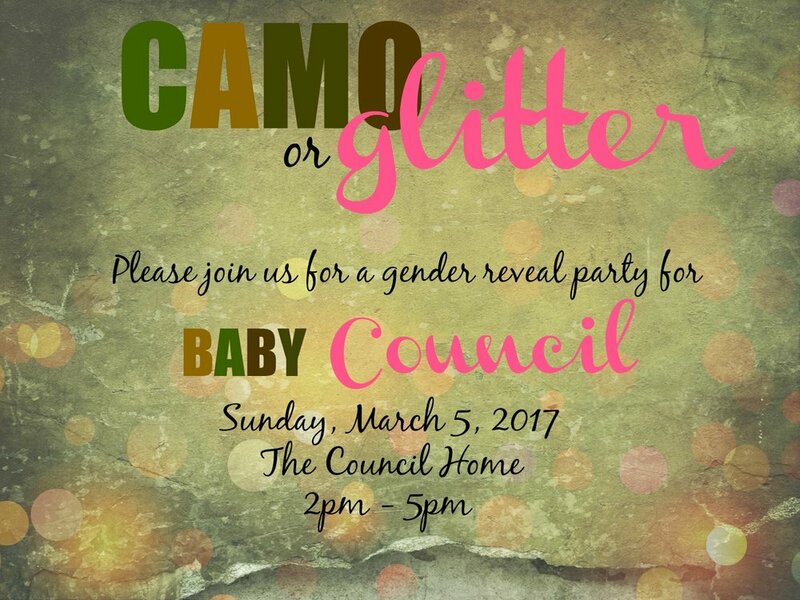 Gender Reveal - Camo or Glitter? Several years ago, gender reveal parties were unheard of. Today, they are growing in popularity and sometimes even more extravagant than a baby shower! Okay, you get the idea. For my dear cousin, I knew whatever it was had to match her and her husband’s personalities and interests. Here are a few examples of invitations I made for her to choose from. Guess which one they picked? Yep, camo or glitter! This theme fits them perfectly. She was able to print out invitations with their address and also use this photo as a Facebook invite (and logo). Side note: If you have a party coming up or anything else you need a design for, let me know. I would love to help! Email cotaube@gmail.com. Fortunately, Hobby Lobby had the perfect themed items for camo and glitter. Also, I decided to make a hanging banner. Actually, we decided to have one for camo and one for glitter. These were super simple to make. I love how they are camo and glitter, but also boy/girl (themed). And the last decor item I made, diaper bundles! I made 2 for glitter and 2 for camo. The white and pink ones are dish towels, and I found bandanas for the camo bundles. These also doubled as a nice gift! To reveal the gender, they decided to shoot a target and use the gun powder to reveal the gender. My cousin used the scrapbook paper to cover the box (AKA the target). After filming the reveal, I was able to create a quick video for the rest of the family to watch at the party. Here's a few images from the gender reveal party. What a wonderful way to celebrate the newest addition to their family! Newer PostHomemade dog treats: Happy birthday Nash! Older PostDIY Concrete Countertops - Part 2, pouring and finishing.